NVIDIA just announced their newest Graphics card the NVIDIA GeForce 310 an entry level graphics processor that replaces the users standard integrated graphics card. 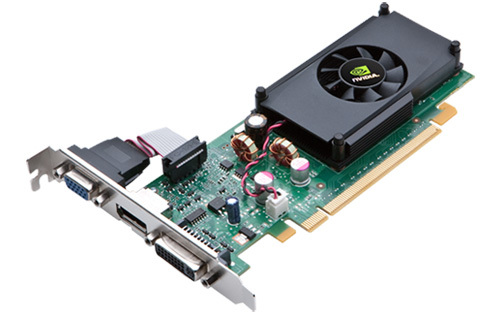 The GeForce 310 can be used as a low-end graphics solution, to enhance photo and video editing, watch HD movies, play mainstream 3D games, and a complete Windows 7 support.The 310 is a PCI-Express 2.0 card, which supports OpenGL 3.0 and Microsoft DirectX 10.1, has a 64-bit memory interface, 16 CUDA cores and a memory bandwidth of 8Gbps.The card has 16 processing cores, the GPU core is clocked at 589MHz, it comes with 512 MB DDR2 (500MHz, 64-bit) and supports Nvidia’s PureVideo and CUDA technologies, Microsoft DirectX 10.1 as well as OpenGL 3.1.It is equipped with DVI, VGA and DisplayPort connectors, supports HDMI Via dongle (DVI-HDMI or DP-HDMI) and also has a internal Audio Input for HDMI. Finally Every PC needs good graphics,that’s what NVIDIA says.